I think a goodly proportion of you readers have already figured this out for yourselves since it was launched last March, but I didn't download and install it until last weekend, so this is new to me: Google Mars is awesome. It is incorporated into Google Earth and uses the same engine, allowing you to spin a 3D globe of Mars around in space, zoom in and out with your mouse wheel, navigate quickly to named features, and much more. The feature I'm (already) finding most useful is the layers containing information on high-resolution image locations. There are layers that include the outlines of all HiRISE, CTX, MOC, HRSC, and CRISM images that have been archived to public servers. So, zoom in on a feature of interest (like, say, Pollack crater, home of the famous White Rock), and you can easily see where high-res photos have been taken. Click on any of those outlines, and you can see a browse version of the high-res image with some basic information on the observation and a link to where you can download the full-resolution version. Marvelous. The colors of the lines are keyed to different image layers. Red: HiRISE. Orange: CTX. Yellow: MOC. Green: HRSC. Blue: CRISM. 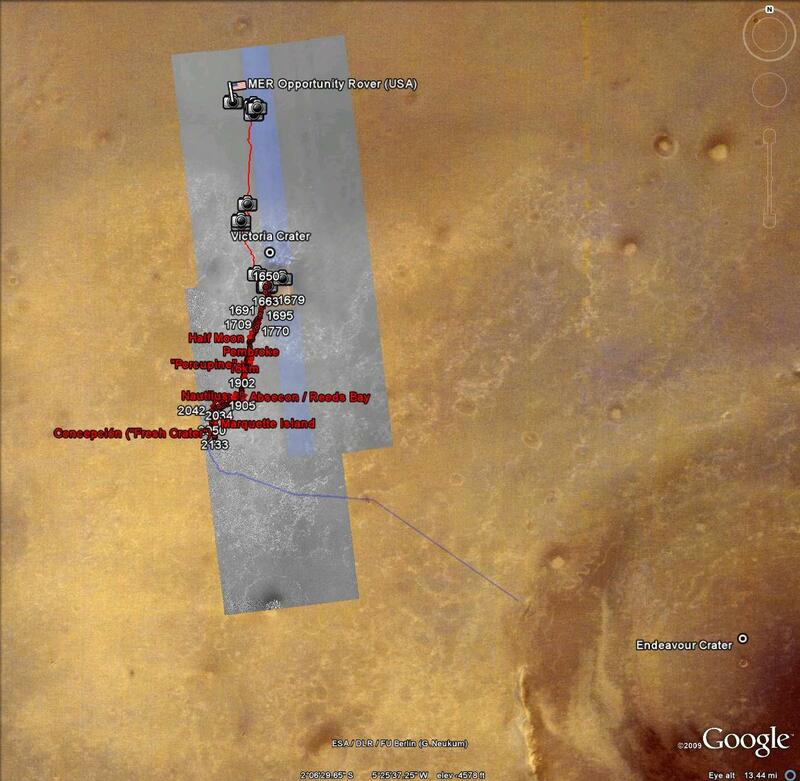 The guys at unmannedspaceflight.com have developed another use for Google Mars, keeping Opportunity's route map updated within it. Here's an overview of Opportunity's route to date. 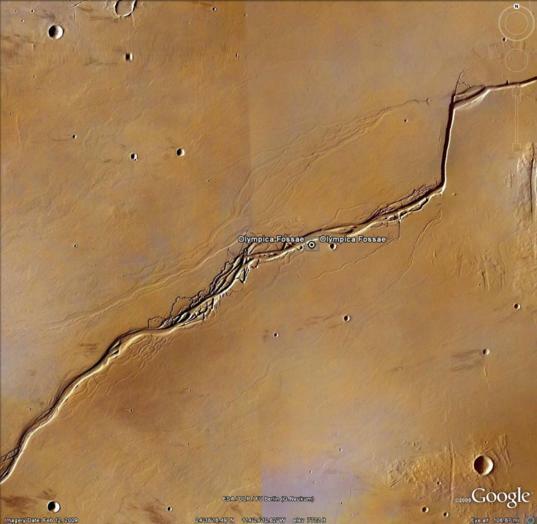 The first part of the route is mapped on a layer included within Google Mars, but that layer only takes Opportunity to a little beyond Victoria. The rest of the map, in all its glorious detail, is being maintained by Eduardo Tesheiner. Recently, Opportunity wandered off the edge of the high-resolution HiRISE image of the landing site included within Google Mars. Fortunately, unmannedspaceflight.com member John Cody solved the problem by creating a new Google Mars layer that includes a tiled and geolocated (areolocated?) version of an image that covers Opportunity's current and likely near-future path. If you'd like to follow Opportunity's traverse toward Endeavour crater within Google Mars, you'll need to download another HiRISE image. HiRISE images are not small; this one is 256 MB Zipped up. I have hosted it for all you rover fans here. 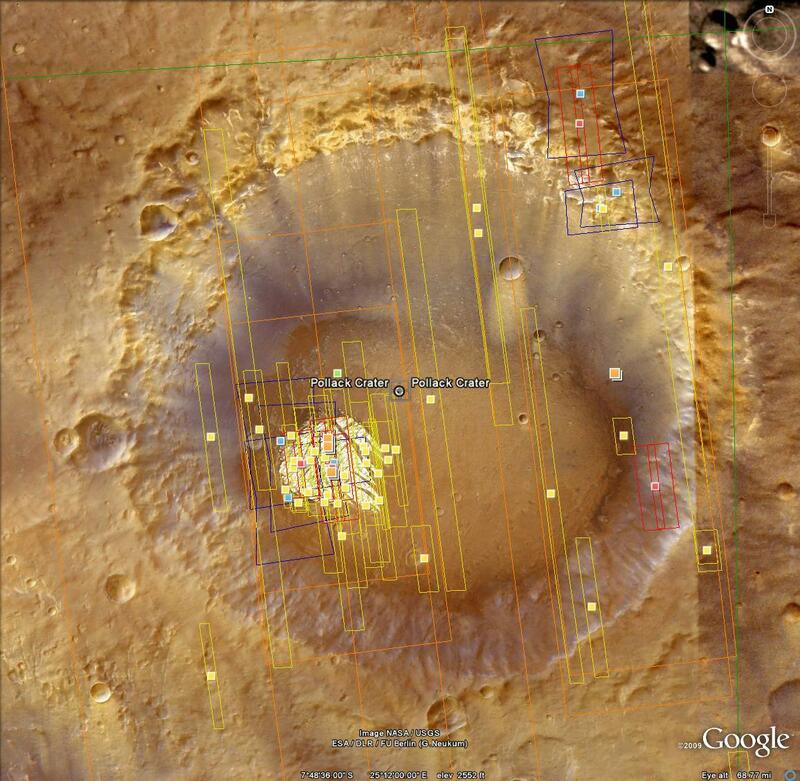 Once you download it, unzip it, then open the file "MER-B map extension version 2.0.kml" within Google Mars. Then, to update Opportunity's path, visit the "Opportunity Route Map" thread on unmannedspaceflight.com to download Eduardo's latest kml file. Here's a screen cap showing where Opportunity is now. I love how Eduardo maps every dogleg in Opportunity's path. 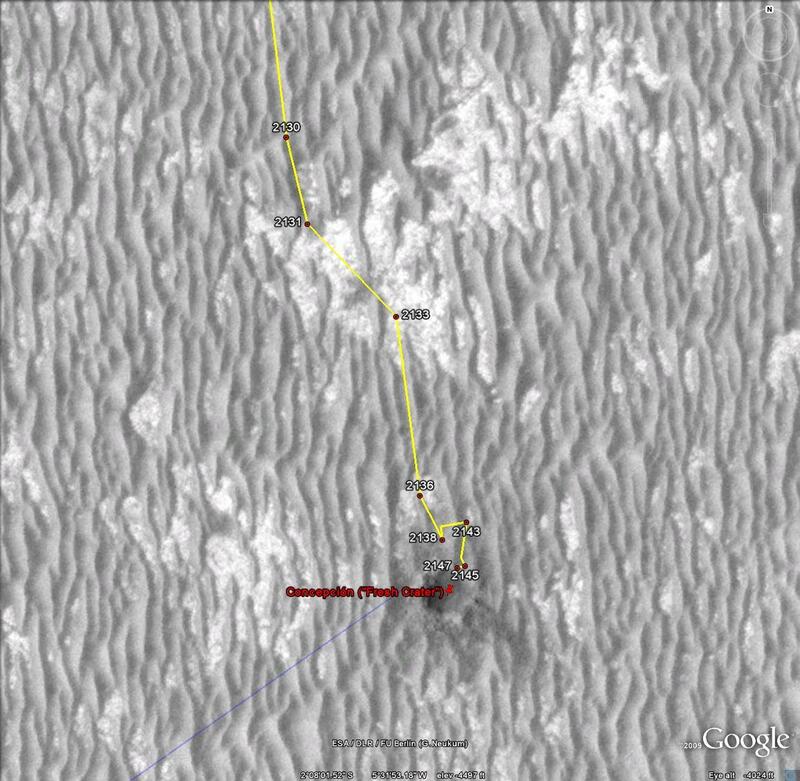 Eduardo's kml file of Opportunity's path includes another contribution from John Cody, the approximate route planned for the rest of the trip to Endeavour (the blue path in the screen cap above). You can see they'll be heading south for a little longer, then will make a sharp turn to the east along some nice-looking bedrock-rich terrain, stopping at another fresh, rayed crater (one considerably larger than Concepcion) before turning southeast toward Endeavour's rim. I've now had several fun evenings where, after putting the kids to bed, I unwind by cracking open a beer and flying around Mars to see what there is to see. I think that the feature below, Olympica Fossae, is the coolest place I've "discovered" so far. I'm not sure what's going on here, but I'm looking forward to digging deeper into the higher-resolution imagery. There is also a Google Moon application within Google Earth, but they don't (yet) have the handy-dandy high-res image outline layer -- I am hoping that this is just because they plan to do it with Lunar Reconnaissance Orbiter images, which have not yet been officially released to the Planetary Data System. Now why isn't there a Google Venus? Or Google Enceladus? What's holding them back? This is cool enough, but I want more! !